The VP (Vulvar Pain) Foundation was established in 1992 as a non-profit organization to end the isolation of women suffering from vulvar pain and related disorders (fibromyalgia, interstitial cystitis, irritable bowel). The Foundations purposes are to give reliable information, hope, safety, and success to sufferers and their families, to advance the standard of medical practice in treating vulvar pain syndrome, and to promote scientific research. An international organization, the Foundation publishes The VP Foundation Newsletter and The Low Oxalate Cookbook, sponsors research, and coordinates a network of personal support and other resources for its members. It also conducts a program of public education and outreach. The fellowship of those who bear the Mark of Pain. Who are the members of this Fellowship? Those who have learned by experience what physical pain and bodily anguish mean, belong together all the world over; they are united by a secret bond. 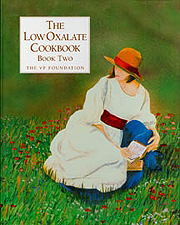 The Low Oxalate Cookbook - Book Two.